Apple fans: unless you have been hiding under a rock for the past week you may be aware that Apple this week announced a couple of iPad upgrades. Significantly the iPad mini has been upgraded to include a Retina Display, a move that many predicted, but a welcome move nonetheless. As you might expect the tech press has been quick to pass judgment with hands-on reviews of the iPad mini with Retina Display, even though it isn't due to launch until 'late November'. Readar, so you don't have to I have trawled the dark recesses of the internet, extracting the early thoughts of tech editors the world over. Well, in the UK and the US. Here is a very early iPad mini what Retina Display review of reviewsm in which the titles are listed in alphabetical order. We don't want any weedy tech journos duking it out. Let's head over and see what those cool types at Engadget have to say about the iPad mini with Retina Display: "There isn't much on the outside that we haven't seen before -- in fact, it still sports the same home button, indicating that it doesn't feature a Touch ID fingerprint sensor. But, there is one glaring exception: the 2048 x 1536 Retina display, which amounts to 324 ppi. "This is the same pixel count as the iPad Air, which means it actually has a much higher pixel density (264 ppi) than its bigger sibling. And even more importantly, when compared to the original iPad mini that came out last year, this is a rather significant bump in resolution and we came away much more impressed with the mini as a result. "On the inside, the mini includes a jump to an A7 processor (the same one used in the iPhone 5s) and at first blush, it does seem a bit faster than the original. Still, we imagine the biggest boost in performance will have to do with multitasking and gaming, which we unfortunately weren't able to do much of during our time with the device. You'll also be able to take advantage of the same M7 co-processor now found in the iPad Air and iPhone 5s." So that's the what, but is it any good? Our friends over at Expert Reviews have a view: "Given the faster processor and the high-resolution screen, it's certainly looking as though the iPad Mini with Retina is going to be the small tablet to buy and a worthy upgrade to the existing model." Meanwhile some clown called 'Matt Egan' over at PC Advisor had this to say: "Before you turn it on the new iPad mini looks a lot like the old iPad mini, but once you see the screen you'll appreciate the difference thanks to the Retina display. "Apple was using the Auto CAD app as a great example to show off the 3D capabilities of the new iPad mini with Retina. They were also able to demonstrate zooming in to see the fine detail in one of the designs, something that might have been lost in a blur on the old iPad mini. "We watched the new iPhoto iOS app at work as beautiful images were edited to look even more beautiful using sliders that are easy to master." "There's no Touch ID on the new iPad Mini, no multi-coloured chassis options and a similar price tag." "However, with a faster processor, an 128Gb memory option, much better FaceTime HD camera, M7 co-processing and that utterly beautiful hi-res Retina screen, it's hard to change our view of it remaining the best small form-factor, if not THE best tablet on the market." Praise indeed, and prior to proper testing I'd tend to agree. What say you Tech Radar? "The original iPad mini blew us away, but we were also clear on the improvements we wanted to see, and Apple has taken steps to make the iPad mini 2 with Retina even more attractive. 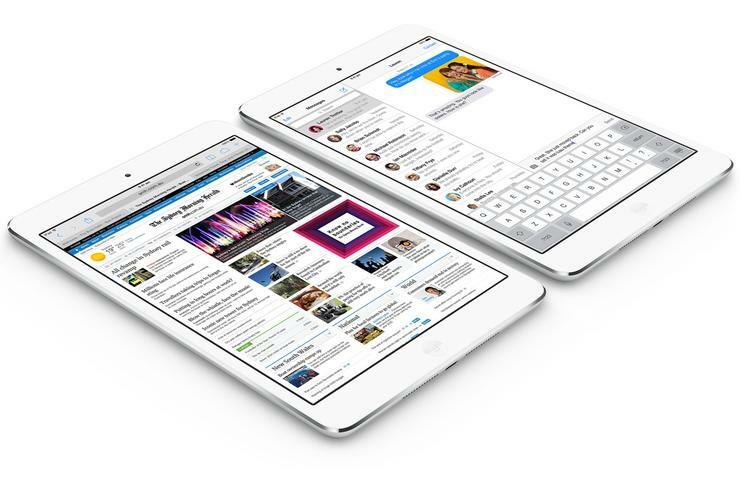 "Faster, prettier and more featured, the new iPad mini is everything we hoped it would be. Although there was nothing that we didn't expect, it should be noted that this is a tablet that ticks every box. "The price is higher again as Apple, like Amazon and Google, looks to step away from the razor-thin margins of last year's budget tablets, but on our early look alone, we think Apple has once again eased ahead in the mid-size slate space." "In essence, Apple chose not to change the iPad mini's basic formula to compete with these new tablets. It kept the same basic form factor as its predecessor, leaving the screen at a 4:3 aspect ratio that helps maintain compatibility with iOS' massive library of apps. That makes the iPad mini a bit wider and a tiny bit more unwieldy than the Nexus 7, but it's a small price to pay for access to the biggest library of tablet apps on the market. The overall build quality, fit, and finish on the new iPad mini is also better than any other tablet on the market which probably explains its starting price." So there you have it. The Technorati is in agreement that on first impressions at least the new iPad mini is a belter.